July saw me in Fort Lauderdale in the United States of America. This was to be an important trip for me, with a lot riding on a successful outcome. 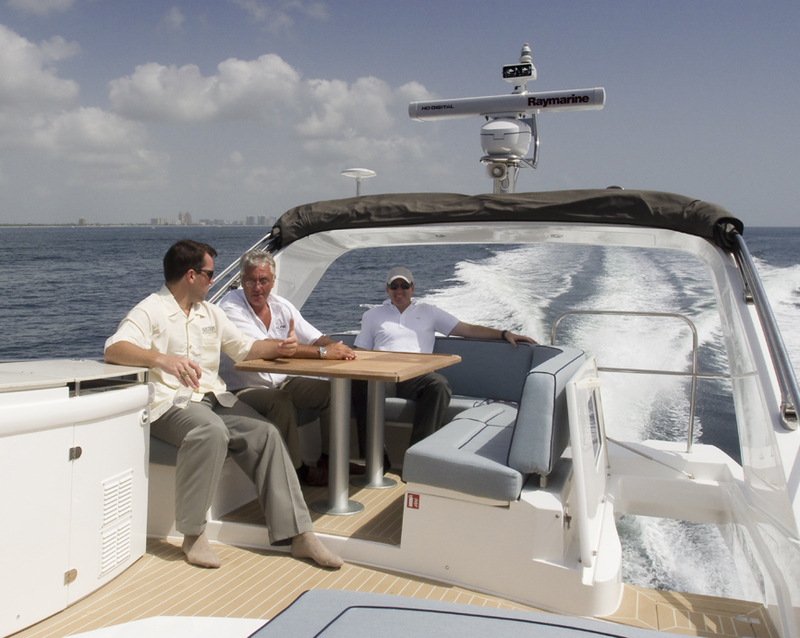 We are introducing our latest models into the American market and we had arranged for the key US yachting press to come and try our new boats. We are very proud of our boats and this was an opportunity to demonstrate our latest offerings to the discerning US boaters. The journey started on a typical overcast, damp and cool UK summer’s day but by the time we‘d landed in Miami that seemed like a world away as we stepped off the plane into a typical south Florida summer’s day – sunny, damp and very, very hot. It was about 90 °F (in European money that’s about 32 degrees Celcius). We all know what hot feels like, as most places in the world experience temperatures like this from time to time but it’s the humidity that’s the killer; my clothes miraculously turned themselves into wet blankets the moment I walked out of the airport terminal. However, by the time we’d made our way onto I-95, the a/c had kicked in and we were beginning to feel more relaxed. 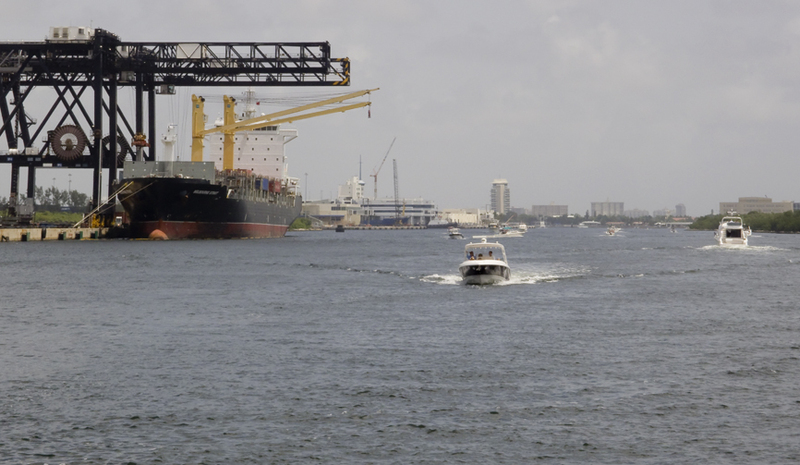 Using my advanced skippering skills to good effect, we missed the turning for Port Everglades. It was only by sheer luck and much gnashing of teeth that we managed to find US-1 and finally the street which our hotel was located on. 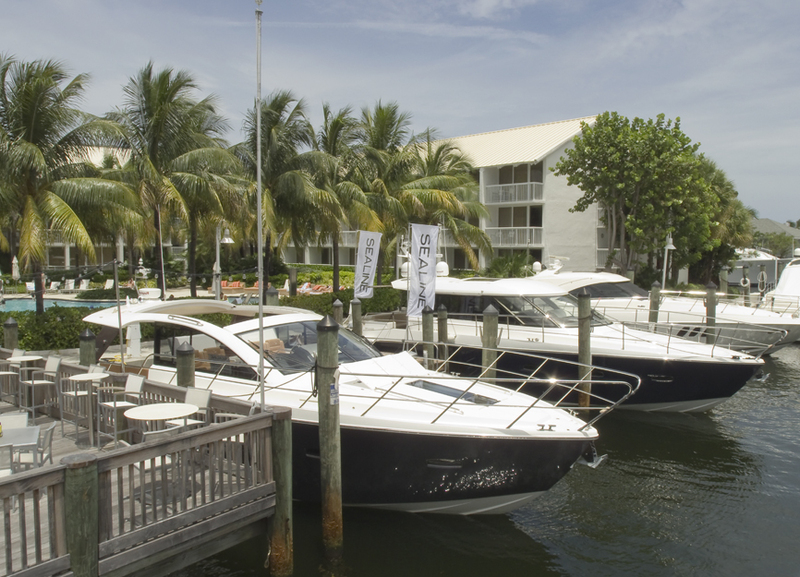 We stayed in the Hilton Fort Lauderdale Marina for a very good reason – the boats were to be based in the hotel’s very own marina and even better, they were to be moored either side of the bar!! Can you see the food & drink connection popping up again? The next couple of days were spent getting everything organised for the arrival of the press; brochures, promotional material, food, booze and something else… now what was it? Yes, of course, the boats! We had a T50 an absolute favourite of mine, the very distinctive C48 and the fabulous SC42. On Saturday morning we fetched the boats from Harbor Towne Marina, where we have an office and some moorings. After doing our checks and sorting out who was taking which boat (I chose the SC42) we set off along the ICW to move the boats to their positions. 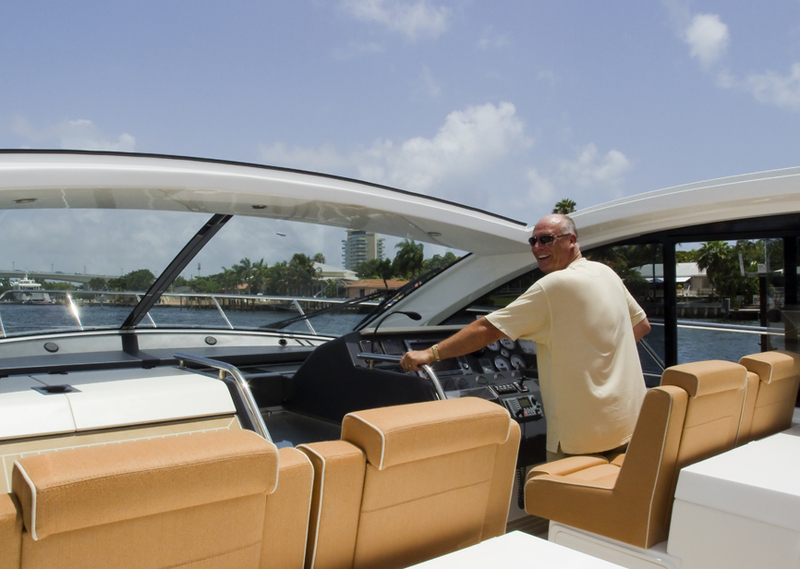 It was a splendid day and it seemed that every boater in Florida had decided the same thing – there were boats of all sizes making their way up and down this marvellous inland waterway. You know, when it’s blowing ‘old boots’ out at sea, you can still make your way up and down the east coast of America as if nothing in particular was happening weather-wise. Sadly, you’ll have to spend a good proportion of the time chugging along at 6 knots but if you remember my Windermere experience, then you’ll remember that this isn’t such a bad thing – get that roof open, slap some meat on the BBQ and get those tunes playing. The following day, our first member of the US boating press was arriving. So I got up bright and early – 4am early actually; I was still on UK time – to find that it was another fabulous, RAINY, Florida day!!! What was happening? I didn’t order rain! Oh well, never mind, I’m used to rain; it happens most of the time in the UK. We timed the run on the first boat, the C48, to perfection. It was simply rain and wind. Gunner loved the boat, as was to be expected – it’s hard not to love the C48, with its dashing good looks and at nearly 50 feet with IPS 600 drives on, it handles lumpy weather with quiet nonchalance. We subsequently found that ‘quiet’ is the operative word – doing a noise level check proved that the decibel level inside the C48 on a lumpy sea, roof open or not, was only 68dB. I have to tell you that this figure is absolutely amazing – 76 is normally considered to be more than acceptable, so 68 is extraordinary! The timing for the run on the T50, however, was not so good. The rain had become a monsoon. Now, it’s all very well tying up to a cocktail bar but when it’s so tight that you can’t get a business card between the boat and the mooring piles it’s not a good idea to drive from inside… By the time we’d finished our run on the T50 which, by the way, performed equally as well as the C48, I looked like a drowned rat. I’d figured out that wearing a shirt would be pointless but out of respect for the natives and a sense of decorum I chose to keep my shorts on – imagine the carnage that could have been caused by other water-users glimpsing a nearly naked, sodden skipper at the helm of a 50 foot motor cruiser, hurtling up and down the channel to Port Everglades in a downpour of apocalyptic proportions; the damage to our respective countries ‘Special Relationship’ would have been incalculable! Thankfully, the SC42 had a roof and we managed to complete the testing without any of the previous rain issues rearing their heads for a second time. Needless to say, the SC42 performed as it should have. The credit for the boats all performing well in this foul weather has to go the magnificent hulls and the way they take rough conditions in their stride. 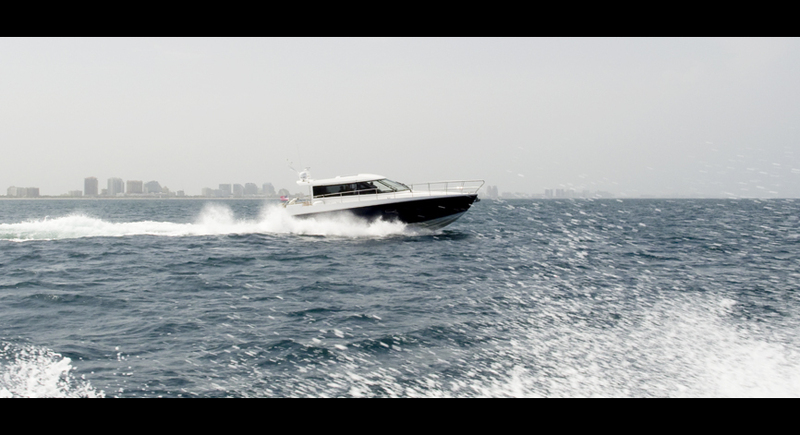 As a matter of fact Gunner was delighted; apparently, it’s not often he has the opportunity to test boats in bad weather and the results made it easy for him to write a glowing report of just how fantastic Sealine boats actually are when it’s rough at sea. The subsequent days were more typical of Floridian weather and journalist after journalist came, tested and went. Each one declaring their surprise and delight at just how good our boats really are. They loved the handling, of course, but also the many details and innovations. Everyone was impressed with the feeling of quality and craftsmanship that runs right through each boat. 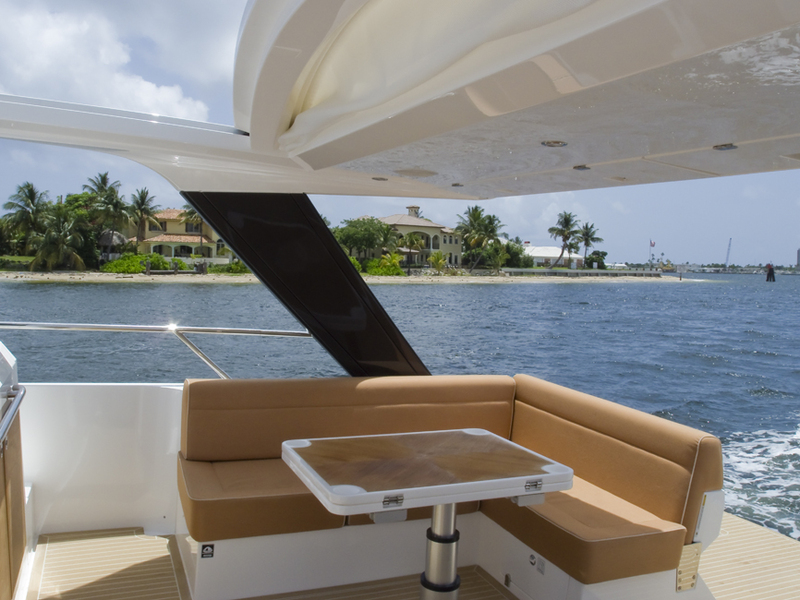 The T50 and C48 were instantly spotted as being perfect cruising boats, especially the C48 with the ability to shelter from the searing summer heat and yet having the option to open the boat up and make it feel more of a sports boat. The SC42 undoubtedly stole the show though and was informally crowned ‘Party Boat of the Year’ – on one trip out I had to resist the urge to steer east and head off for an afternoon anchored at the Bimini Islands which, I have to say, was very tempting. So, finally, when everyone had said their goodbyes and gone their separate ways, we took the boats back down the ICW to Harbor Towne Marina and put them to bed. (Tied them up and plugged them in to the shore power). It had been a good few days and proved to us that our assumptions were correct – America loves Sealine! This has been another Captain Corbett’s Adventure. If I’m not on Jersey teaching a private tuition Day Skipper theory or Yachtmaster theory course, then I’m either spending time with someone on their boat, giving them the confidence to take their boat out with their family and friends on board or I’m off somewhere exotic delivering a boat. Either way, I’ll write it up and put it on the Blog for you all to see, so keep popping back to see my most recent adventures..
You say that but somehow I don’t really believe you! Could you not persuade one of the airlines that Thanks Mum is only a toy and get them to fit her in the hold? Im SURE you MUST has a bit of space in your hand luggage !!!!!!!!!!! For you Steve, I will make some space. I’ll throw out all my non-essential clothing items like trousers and shirts and just a few tee-shirts and shorts instead.